The Fire and Rescue (F&R) Department provides emergency response services to the 1,360-square mile NNSS, 24 hours a day, seven days a week. The Department ensures the safety of the Site’s 3,000-plus workers performing the nuclear Stockpile Stewardship Program, as well as numerous other programs which support the homeland security mission. F&R personnel are highly-trained in a variety of skill areas, which also allows them to deploy to emergencies adjacent to the NNSS. 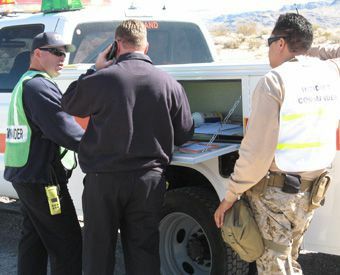 These include medical emergencies, wildland fires, vehicle fires and accidents, vehicle rescue, and hazardous materials (HAZMAT) incidents on U.S. Highway 95 and other areas within Nye and Clark Counties. F&R was established on October 9, 1951 as a handful of men used pickup trucks to protect the NNSS from fire and other hazards during the nuclear testing era. Today, the department is composed of fully-equipped, highly-trained paramedics and firefighters who provide fire suppression, emergency medical services, HAZMAT mitigation, technical rescue, incident command functions, and fire prevention activities around the clock. F&R personnel total almost 70 people, including a Fire Chief, two Deputy Chiefs, a Fire Marshal, Fire Prevention staff, and members of the A, B, and C platoons. NNSS F&R moved into state-of-the-art fire stations in 2010, enhancing F&R firefighters’ and paramedics’ service to the NNSS and local emergency agencies who rely on them for assistance. The fire stations meet the standards of the National Fire Protection Association. Fire Station 1, located in Mercury, is 28,600 square feet and has nine station bays for emergency vehicles. It houses seven firefighters and five paramedics assigned to one of three 56-hour shift platoons, and an additional 10 personnel assigned to the day shift – administration and fire prevention staff. Fire Station 2, located in Area 6, is 14,200 square feet, has four station bays, and two paramedics and five firefighters assigned to one of three 56-hour shift platoons. 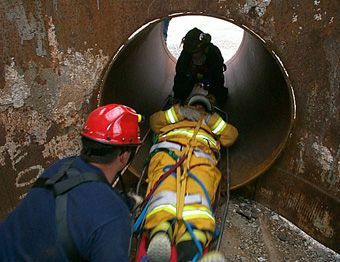 The stations’ combined equipment includes two fire engines containing a 1,000-gallon tank and 120-gallon foam tank capable of pumping 1,250 gallons of water per minute (gpm); two heavy rescue trucks containing specialty equipment for mitigation of all types of rescue incidents; five advanced life support (paramedic) ambulances, Battalion Chief vehicle equipped for multiple-victim incident response, an Assistant Chief incident command vehicle, light duty Chief Officer vehicles, and six Type VI wildland engines. The stations are also equipped with specialty equipment for use during various types of emergencies including a HAZMAT trailer, wildland fire extended operations trailer, 10 specially equipped all-terrain vehicles (ATV’s), a breathing-air resupply trailer, a reserve fire engine (1000 gallon/1250 gpm) assigned to the fire prevention staff, a 2000 gallon/750 gpm water tender, and a Mobile Incident Command Post (MICP) vehicle. F&R personnel participate in a rigorous training program designed to enhance and maintain firefighter and paramedic knowledge and skills. The training program meets national and state requirements and standards and covers a wide variety of response disciplines. It consists of classroom and hands-on components. NNSS F&R has a multiple-acre training facility where the majority of the hands-on training takes place. All re-certifications are handled at the NNSS, and F&R conducts numerous training programs for off-site agencies.